I LOVE my niece and nephew. Our society uses “love” in many ways with just one word. When I felt led to write this study, I was a little like Moses, coming up with excuses. Describe the love of God? I don’t even understand the full love of God. whom I have doubted and, truthfully, wanted nothing to do with sometimes. How could I write about His love? Then, I realized there was a lot of “I” in my excuses. Relying on MY own understanding, MY thoughts, and MY answers. After I said “yes”, “love” became my word for 2019. I didn’t choose “love” for my word this year; it chose me. 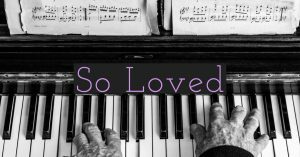 It started by asking God to give me a love for Him and His Word, which led to this Journey Study, which brings me to the joy of sharing what the phrase “so loved” tucked inside John 3:16 means to me. It’s easy to focus on “love” and overlook “so”. Such a tiny word, but it’s emphatic nature is not to be missed. The verse could say “God loved the world”. While God’s love is emphatic, it’s also active. 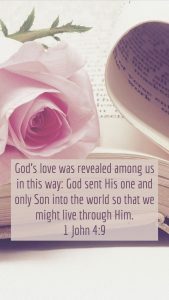 I John 4:8 says, “God IS love”. Not “God was love” or “God is love today”, but God’s continuous love is perpetually active ever nanosecond of everyday of every millennia. Remember our four Greek words for love? This one in John 3:16 is agape. While it can have strong emotion, it’s not rooted in it, making it durable, long-lasting, and dependable. This love carries genuine interest and determined dedication. W.E. Vine says agapao “expresses the deep and constant love and interest of a perfect Being towards entirely unworthy objects, producing and fostering a reverential love in them towards the Giver, and a practical love towards those who are partakers of the same, and desire to help others to seek the Giver.” (Expository Dictionary of New Testament Words Vol III, pg 21). 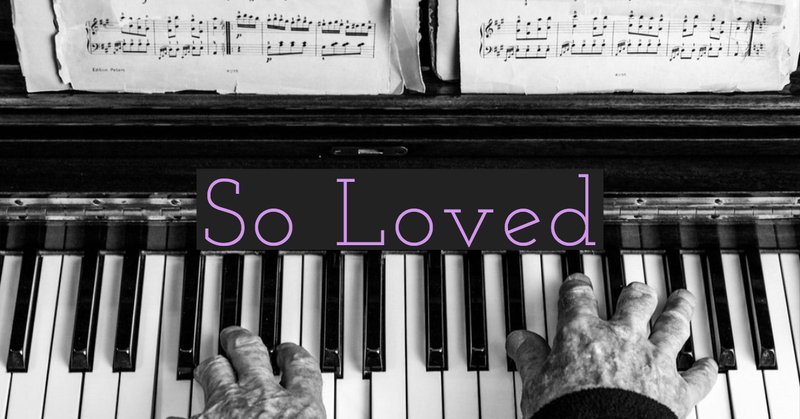 How do we really understand the sheer magnitude of this love? Putting it into words is like attempting to describe “red” to a person with blindness. A nearly impossible task without mutually understandable terms for colors. Ephesians 3:17-19 describes the amazing love of God using framework language we are familiar with. “… you being rooted and grounded in love, may have strength to comprehend with all the saints what is the breadth (width) and length and height and depth, and to know the love of Christ that surpasses knowledge”. How high and wide is God’s love? We measure in feet for walls of a house or time for the day. Take a yardstick (in your mind) and measure God’s love. A few inches? The whole yardstick? How about a different tool? Have you tried to measure God’s love by your circumstances or your performance? If I’m good enough, God will love me more. What’s the measure of God’s love? His hands have gathered the seas as He holds them in His palm. The nations are a drop in a bucket to Him. He weighs the mountains on a countertop scale. Who could possibly measure the vast Spirit of the Lord?! At the same time He counts armies and countries as weightless, He gathers each of us as a lamb in His arms, carrying us close to His heart, and gently leading us by the hand. (Isaiah 40:11) The very same God! His is a measuring stick without numbers! How far-reaching is God’s love? The death of His Son. The Mariana Trench in the Pacific Ocean has the greatest ocean depth of 36,070 feet. If I went to the bottom of the ocean, would God’s love find me? Our sin takes us vastly deeper than the Mariana Trench, yet God still reached down to offer His “So” emphatic, perpetual love. How high is God’s love? This friendship has hurt me. Have you found the limit of His love? Beyond all circumstances, beyond all measure, beyond all fears. Have you experienced this boundless, enduring love by beginning a relationship with Him? Throw out your measuring sticks and allow His overwhelming love to surpass you, hemming you in on all sides! Do you remember begging for a certain gift as a child? What was it like when you received it? Were you disappointed or was it exactly as you imagined? Is there something you desire more than anything? Something you’re waiting for God to deliver? When I’m feeling disappointed about unfulfilled desires, I think of Hannah. Hannah was married to Elkanah, husband of two wives. Peninnah, the other wife, had plenty of children, but Hannah, shamefully, was barren. Adding to her heavy shame, Peninnah provoked Hannah, mocking her empty womb. Oh, that hits your gut doesn’t it?! Have you been in her shoes? Or perhaps you’ve worn Peninnah’s shoes a few times too, provoking just to stir up trouble, finding a sense of satisfaction in what you have instead of another’s “have nots”. Each year the family traveled to Jerusalem for worship. This particular year Hannah was so distressed, she refused food. I see much of myself in Hannah. I too have carried shame and broken dreams, losing hope along the way. I too have had a “Peninnah” in my life, so distressed I hurt. Hannah responded as each of us should, she worshipped through prayer. Hannah opened her heart to her God, praying God would remove her shame and fulfill her dreams. She asked God for a son, promising to relinquish him back to God for service in the temple his entire life. she would have a son! No longer marked by shame and lost dreams, Hannah held the little boy hand of her dream-come-true, entrusting him to the Lord as she left him at the temple to serve the Lord. Later, her dream son, given back in worship to the Lord, would become a wise judge and humble prophet, mighty in spirit, leading Israel. No, Hannah’s story does not stop here. I’ll be honest, I usually stop here. But if we close the book in chapter 1, we miss the pinnacle of Hannah’s heart in chapter 2. Hannah continued a hymn of worship that had been her relentless song from the moment she first cried out to her God. 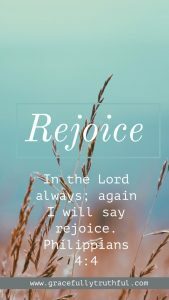 In verse one, Hannah rejoiced in God. She did not rejoice in Samuel. She rejoiced in the Giver, not the gift. instead she focused on the character of the God who had heard her. Just as the horn of a bull signifies its strength, Hannah declared that the Lord had removed her disgrace and weakness, replacing it with His own mighty strength. Was Hannah strengthened because she could prove her value to Peninnah? No, her strength was God. Speaking of Peninnah, is she even mentioned? No, because Hannah didn’t need to. She didn’t carry bitterness and slander because worship had shifted her focus. I wonder if we let worship shift our hearts as well? 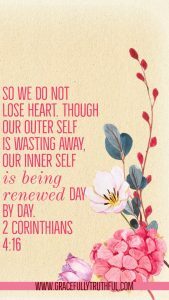 In the midst of everyday life, will we relentlessly worship or relentlessly slander and self-focus, eager to return hurt for hurt, carrying the burdens of bitterness and un-forgiveness. Hannah’s example proves we can’t worship and grudge-carry. God was Hannah’s sole supplier. This wasn’t about physical food, Hannah was hungry for relief. She was hungry for her shame to be lifted and her emptiness to be filled. We know the ending of Hannah’s story. We know she was freed from shame and filled with the Lord Himself. We don’t know our story’s end. We ask, will I ever be delivered? Will I always be empty? she chose relentless worship before He answered her prayer. Yet, she didn’t give up. but our faithful God will deliver, free, fill us. Until then, we relentlessly worship! Thanks for joining us today as we journeyed into Worship IV Week Two! Don’t miss out on the discussion below – we’d love to hear your thoughts! “When We All Get To Heaven” is a hymn written by Eliza E. Hewitt around the late 1800s. Eliza was bedridden for a time during which, she wrote a number of poems that were later put to music. When We All Get to Heaven was one of these. This hymn of old is one that I sang growing up. I more than likely played it out of the hymnbook at the piano as well. 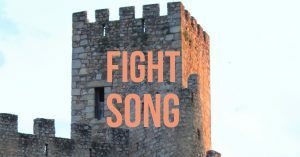 Sometimes when we sing songs over and over, the songs become rote memory and the meaning fades, or perhaps we never paused to consider the significance of those thoughtfully penned words in the first place. Eliza E. Hewitt focuses on the glory of Heaven in her hymn. Its beauty, the pearly gates, and streets of gold are wonderful, but none are as glorious as the reward of seeing Jesus. Yet, as glorious as it will truly be “when we all get to Heaven”, the often passed over middle verses of this beloved hymn hold solid truth for our everyday messiness. Getting to Heaven will be wonderful, but before that sweet destination, we are on a journey. Not a shadow not a sigh. As believers in Christ, we are on a journey, a pilgrimage. We hear about pilgrims at Thanksgiving perhaps picturing women in long dresses or men in short pants and belt buckle shoes. Did you know we are pilgrims? Not the pilgrims from England, but pilgrims in the middle of the everyday chaos and beauty of temporal life as we journey forward towards the eternal life that will never fade! Our time on earth is a pilgrimage. Eliza continues to unpack this idea of what our journey as pilgrims looks like. As believers, we are seeking after God, desiring to be true and faithful to who He has called us to be. (I Timothy 6:12) We study His character as He reveals Himself to us through Scripture. The more we discover about His goodness and love, the easier our pilgrim hearts learn to trust Him, which overflows into serving Him with all that we are. Even in the crazy of our Journeying. 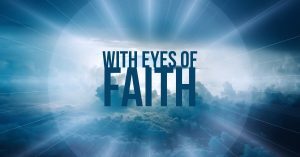 Hebrews 11 is known as the “faith chapter” of the Bible, full of stories of pilgrims just like us, journeying onward toward a glorious reward they couldn’t yet see. towards the reward of a sweeter relationship with Him. These pilgrims’ journey was arduous. Yet, God had prepared something better for them. I don’t have to tell you that life will have dark clouds overspreading our skies as Eliza writes about. Many of us deal with dark clouds daily. heartaches and hurts from friends/family members. 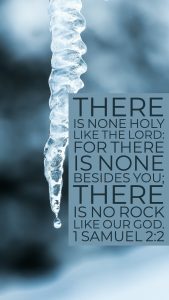 we are never alone as the ancient hymn of the Israelites proclaims. 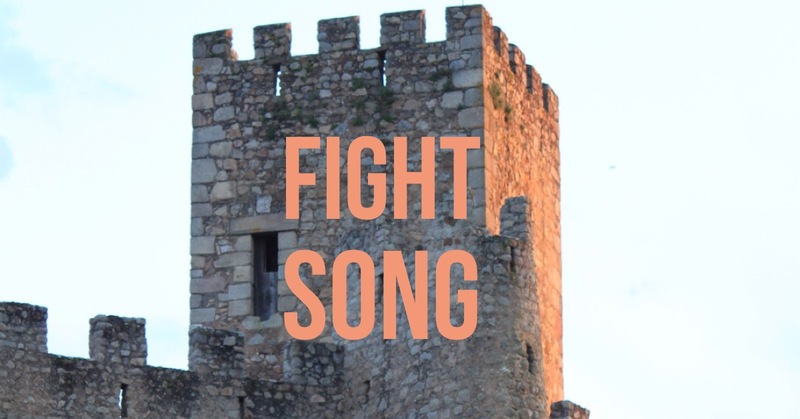 Make this song your own today! both now and forever. Ready for more? Dig Deeper! Thanks for joining us today as we journeyed into Worship III Week Three! Don’t miss out on the discussion below – we’d love to hear your thoughts! Here’s a link to all past studies in Worship III! Music is an amazing gift from God! Originally written in German by the well-known theologian, Martin Luther, this hymn is the most widely translated around the world. I remember singing this hymn growing up and I still sing it today. As a child, I didn’t understand many of the big words such as “bulwark” and “Sabaoth” or Old English words like “abideth” and “doth”. Now as an adult, these powerful words hold deep meaning. The history behind the hymn makes the words even more remarkable. Set against the contentious backdrop of the Protestant Reformation, this hymn was written around 1527-1529. Martin Luther had posted his Ninety-Five Theses approximately 10 years before he penned this hymn. Luther bravely stood up to the Roman Catholic belief system with Scriptural truth. Had he not done this, we ourselves may have been lost! Over time, it has become the anthem of the Christian faith. Martin Luther staked his life upon the certainty of Scripture. 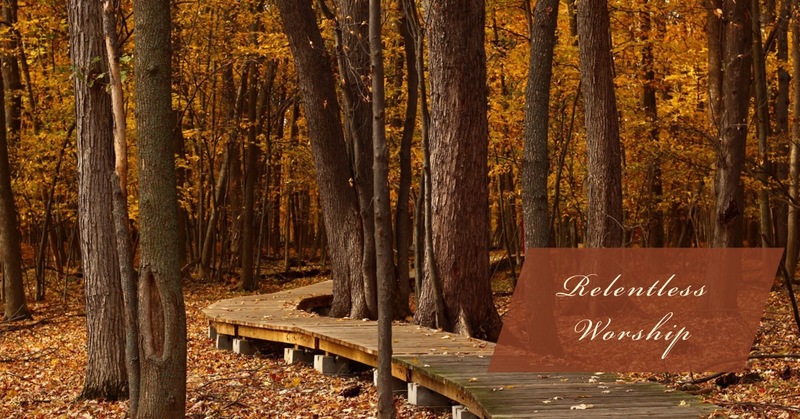 This hymn reflects those deep roots in God’s Word and His character. Never leaving us alone to fend for ourselves. None could save us, but the Almighty God wrapped in human flesh, willing to exchange His righteousness for our filthy rags of sin. Verse 3 reminds us of anchoring truth despite these realities. Truths rooted in Ephesians 6:10-18 which describe our daily battle. Did you know there is a war going on? A war not with flesh and blood, but with the powers of darkness. It may be easy to say we are at war, but are we actually fighting in the war? I slip into fighting myself, which is what the Devil wants. I also fight God, which is also what the Devil wants. To fight God and myself, I don’t need many weapons. Just a few negative thoughts and some misguided theology and I’m set. The war against Satan needs real weapons. Weapons we can’t attain on our own. God provides His own armor for us in the fight against the Devil. He doesn’t send us to the battle alone, nor does He send us without protection. The question is, are we really taking up the armor of God and USING it? God wouldn’t have given us this armor if we didn’t need it. or if you’re fighting un-armed. It doesn’t take much to get Satan to leave us alone. Just the name of Jesus. In Matthew 4:1-11 we see the Devil lead Jesus into the wilderness, tempting Him to throw away Who He is and His purpose. Verse 11 says, “Then the Devil left Him”. What did Jesus do to get the devil to flee? He used Scripture, the “belt of Truth” and the “Sword of the Spirit”. He used the Armor of God! Luther concludes his battle hymn with truths echoed in I Corinthians 12, which speak of the gifts God gives to His children. Do you know your Spiritual gifts? Each gift from God is special and is meant to be used for His glory in specific ways as you live out your everyday life. How have you used your gifts this week? The neighbor who can’t get out much, could you run to the store for them? The child who needs a hug, would you give them one? The family who is grieving a loved one, would you send them a card or make a meal? it’s conquered by truth, love, and the Name of Jesus Christ by which we are saved. The love He gives us to share with others. And the testimony of His name, by which every knee will bow, even the Enemy’s! 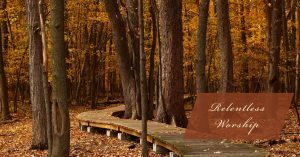 Be encouraged by Luther’s “Battle Hymn”, Sisters, and make it your own! Thanks for joining us today as we journeyed into Worship III Week Two! Don’t miss out on the discussion below – we’d love to hear your thoughts!